This is the story of the 1st and 1/6th Battalions of The East Surrey Regiment in the North African Campaign of 1942-43. The 1st Battalion was in 11 Brigade of 78 Division with the 2nd Bn The Lancashire Fusiliers and the 5th Bn The Northhamptonshire Regiment. 1 Surreys sailed from the River Clyde on 27th October 1942 as part of Operation Torch, and landed on beaches west of Algiers on the night of 7/8 November. The 1/6th Battalion was in 10 Brigade of 4 Division with the 2nd Bn The Bedfordshire and Hertfordshire Regiment and the 2nd Bn The Duke of Cornwall's Light Infantry. They sailed from Glasgow on 16th March 1943 and disembarked at Algiers on 23rd March. 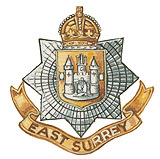 The distinguishing badge of the First Army, commanded by Lieut. 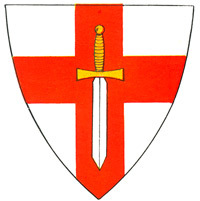 General Sir Kenneth Anderson, K.C.B., M.C., worn throughout the campaign in Tunisia, was the red cross of St. George on a white shield, a crusader's sword superimposed on the upright of the cross. The First Army landed in North Africa in November, 1942, and commanded the British formations which cleared Algeria of the Nazi occupying forces, and holding them during the winter of 1942-43 until the final battles in Tunisia which led to the capitulation of von Arnim and the entire German force in North Arica. First Army was composed of the 5 and 9 Corps. The following description of the First Army badge was given in the Programme of the First Army Thanksgiving Service held in Tunisia for the victory granted to the Allies in North Africa. 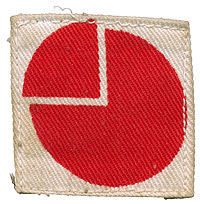 This Regular Division first adopted as its badge the fourth quadrant of a circle in red, but this was later changed to a red circle, with one quadrant displaced, set in a white square. It formed part of the B.E.F., arriving in France as part of 2 Corps in October, 1939. In the evacuation in 1940 it held the west flank of the Dunkirk perimeter. The Division later saw service in North Africa with First Army and with the Central Mediterranean Force in Italy and in Greece. This was a war-formed Division which was raised in Scotland in preparation for the North African Expedition, and landed with "Blade Force" at Algiers on 8th November, 1942. The Division had its first main clash with the enemy at Tebourba. As part of the First Army the Division saw much hard fighting, holding the line along the borders of Algeria and Tunisia during the winter of 1942-43, clinging on to Medjez el Bab, and the fierce fighting at Fort MacGregor and Long Stop Hill. It took part in the final operations in Tunisia culminating in the surrender of the Axis forces at Cap Bon. Landing in Sicily on 25th July, 1943, the Division fought at Cantanuova, Adrano, Bronte, and Randazzo. Operations in Sicily were concluded on 15th August, and the following month saw the Division in Italy fighting up to Larino with the Eighth Army. The 78th were later withdrawn to Egypt, but only for a short time, for the winter saw the Division back in action again in the Apennines. As part of the Eighth Army in 15th Army Group the Division took part in the forcing of the Argenta Gap into Northern Italy, and in the final round-up of the broken German Army reached Austria, where the Division became part of the Army of Occupation. 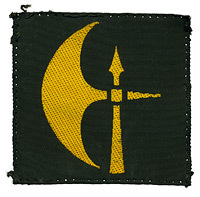 The badge of the 78th Division was a yellow battle-axe on a black square or circular background.